Gross recorded two goals in a 1-1 week for the 49ers, scoring a goal in each contest…tallied his first career game-winning goal in a 2-1 win over Elon on Sept. 4 and added the lone Charlotte goal in a loss at South Carolina on Sept. 1. 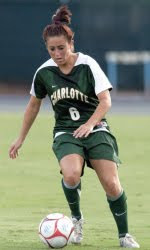 Weinraub amassed five points and seven shots over two matches...scored a pair of goals, including the game-winner, and added an assist on Sept. 4 in Charlotte’s 7-1 win over Francis Marion...marked her third game-winning tally of the season...leads the 49ers in goals (four) and points (nine). Litoborski was the lone 49er named to the All-Tournament team at the High Point Classic over the weekend…led Charlotte in kills with 36 (2.4 kps.) in the four-match week…logged her first career double-double with 16 kills and 13 digs, both career highs in Charlotte's match against High Point on Sept. 5…then set a new career benchmark with 15 digs on Sunday in a five-set thriller against Marshall...finished the weekend with 2.7 digs per set and added six assists, three aces and seven blocks. Making her collegiate debut on Sept. 5 at the USC Upstate Eye Opener, Ruiz placed second out of 65 runners with a time of 18:15...finished just three seconds behind the individual champion...Charlotte placed fourth in the seven-team field.